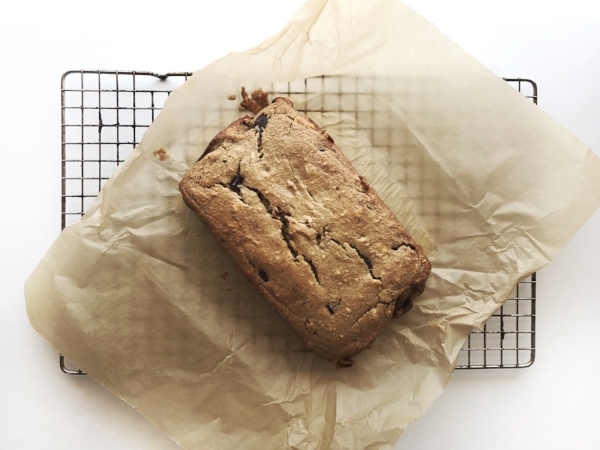 How does anyone decide to come up with a banana bread recipe? Bananas that are way too overripe & you don't want to waste 'em, right? At least that's how the original banana bread recipe came about... that's my theory & I'm stickin' to it. It just so happened to be his birthday week this week as well so he lucked out & got some fully loaded birthday banana bread. I usually toss overripe bananas into my Oatmeal Banana Bread Cookies but I was in the creative mood & decided a new Chunky Monkey Banana Bread recipe was going down. This lovely loaf is gluten free, dairy free, vegan, & refined sugar free. Per ush, this stuff is completely junk free & seriously delicious. Not to mention, (except I am mentioning it) who doesn't love a house that smells like fresh baked banana bread? I sure as hell do. Preheat your oven to 350 & line a 9x5 inch loaf pan with parchment paper. In your blender or food processor, add in all wet ingredients (including overripe bananas) & process until creamy. Make sure not to over-process or mixture will become gummy. In a large bowl, mixture together all dry ingredients (except the add ins) until well combined. Add the wet ingredient mixture to the dry ingredient bowl & mix well. Fold in the chopped nuts, chocolate, & coconut. Pour batter into pre-lined loaf pan (batter will be thick) & pop in the oven for 1 hour or until toothpick inserted in the middle comes out clean. Remove from the oven & let cool for 30 minutes or so. 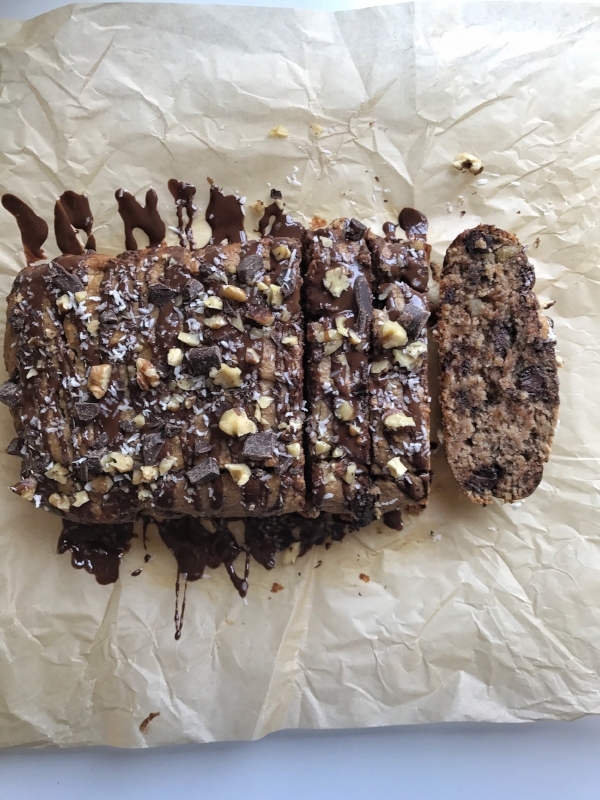 Drizzle with any leftover chocolate, nuts & coconut if desired. *Notes - To make gluten free oat flour, blend oats on high speed in blender until four consistency is achieved!